Friends of Laddy was established after Judi Farr suddenly & tragically lost her beloved English Setter, Laddy, from a heart condition that went undetected. She wanted to take this painful story and manifest it into something positive & wonderful. What better way to bring the community together, to honor Laddy’s life, and your dog’s life, than with a fundraiser that can benefit other dogs in need. 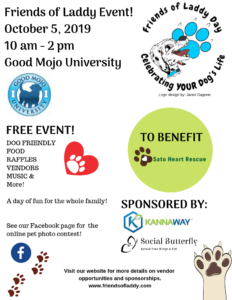 Friends of Laddy will bring the community together for a day of fun, celebration, food, music, raffles, vendors and, of course, this will be a dog friendly event. Proceeds raised by this event will benefit the dogs of Sato Heart Rescue located in Milford, NH and will be used for transports, food, and medical care. Come celebrate HIS life with your fur babies!